If every salesperson had a personal assistant, imagine the impact that their sharpened focus could have on numbers. They’d soar. Currently that seems like an unrealistic ideal, but recent developments in Natural Language Processing (NLP) stand to refute that. Get ready for a new kind of engine, or bot, that brings us closer to closing more deals. Optimizing end-to-end workflows. At a simple command or via auto-recurrence, the bot can execute an array of complex tasks across multiple systems and contacts, eliminating everyday, repetitive tasks. 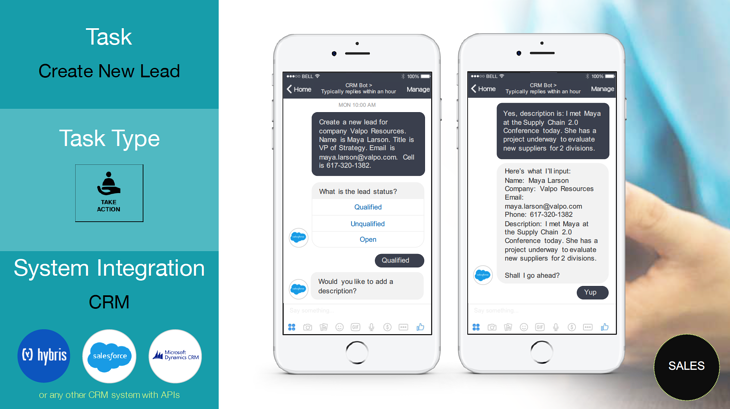 NLP advancements let bots also distinguish the best way to push notifications at optimal times to create efficiencies and support CRM requirements. The constant burden of logging notes and creating tasks goes away for inside and outside sales reps, freeing them to focus on revenue-generating priorities. Gathering critical business and behavioral insights. Reps can now go beyond random, unwarranted check-ins for ongoing updates. Rather, Bots talk to prospects and customers at the right time throughout the lifecycle and aligned to CRM processes, to sustainably capture key, relevant account updates and behavioral insights to highlight new opportunities or expose risks in committed deals. Closing communication gaps. As bots create and interact with tasks and updates, information can instantly be distributed conversationally with business partners that previously may not have had insight to deal updates, or were simply delayed by reps’ busy schedules. This standardizes information sharing and automates enterprise-wide responses, accelerating the entire buying lifecycle. Sales cycles are often choked by tools promising more than they’re designed to do. As traditional solutions – each with their own access and authentication requirements, interfaces and specific, repetitive updating demands – are soon replaced by NLP-designed bots. Reps, prospects and customers, not to mention the bottom line, stand to benefit. Dynamic end-to-end workflows are on the horizon for enterprises everywhere. Learn about the most common enterprise use cases for sales and other internal functions by accessing our Top 30 Use Cases eBook.